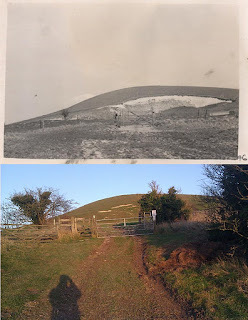 I found a couple of postcards on eBay of All Cannings Cross, taken I guess about 90 years ago. 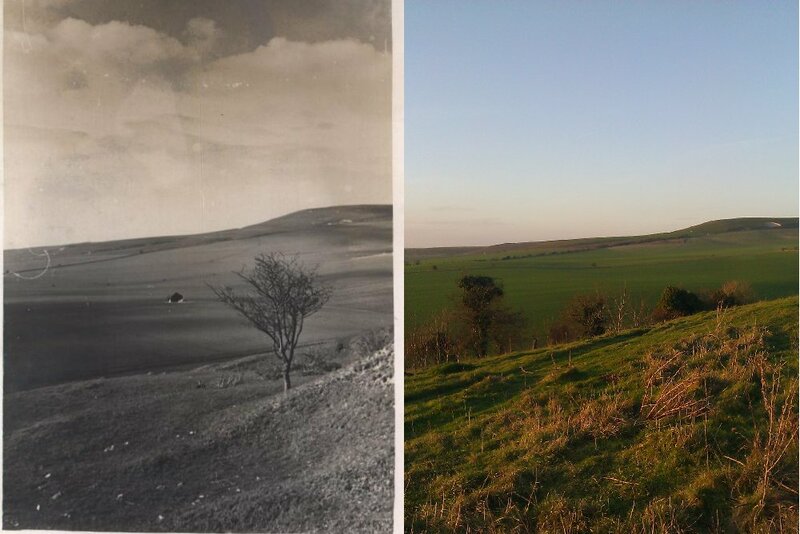 here they are with the same views today. as Vivian Stanshall might have said. Due to changes in the council set up many internet links no longer work so for my convenience here is the new one. The link has changed three times - so search for application " S/2009/1527 "
I was lucky enough to hear David Field's lecture The Stonehenge Landscape Project at Devizes last month. 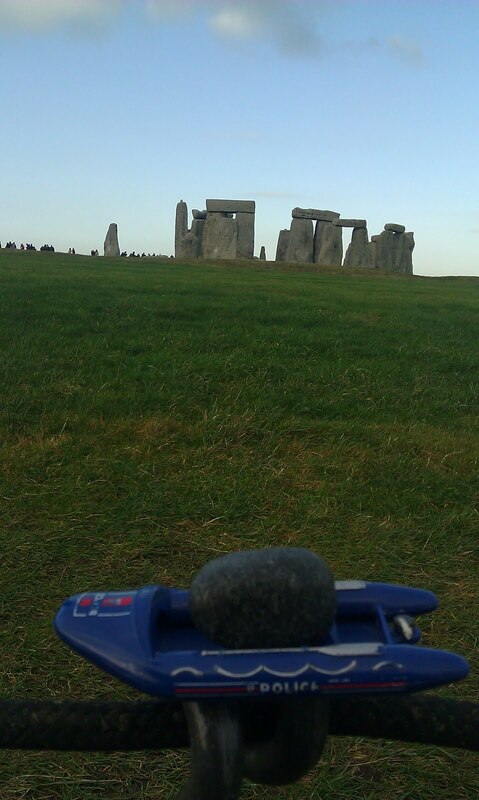 He mentioned the possibility of there having been a central mound in Stonehenge that predated the stones. I know he has yet to release his work but I am not trying to steal any thunder here as others have previously publicised this. It is important to note that this mound might be an artefact of the various excavations of the twentieth century but this 1875 photo, and others, show the ground rising quite clearly before then. So I think we can say it is an original feature. Update July 2014 - Photo from about 1907 showing a policeman standing on the mound. The mound shows up clearly on a contour map of Stonehenge. I have circled it and the North and South Barrows in Red. Source - sarsen56: "A surface contour map of Stonehenge. The ground rises from c. 100m above sea level on the east, to c.103m to the west...note the mounded area within the centre which appears to predate the stones"
There doesn't seem to be any records of any excavations where the mound is which would tell us if it is natural or not. Walking round Stonehenge it looks unnatural. We also don't know if the Barrows, which aren't Barrows of course, predate the ditch or not. 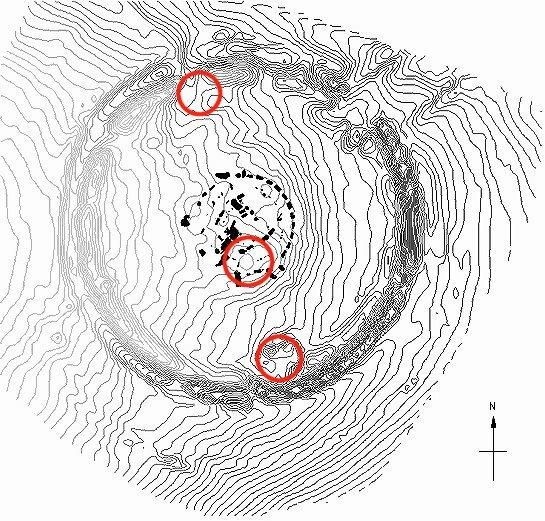 We know they contained central stones, did the middle mound also have one? Is there a stonehole waiting to be found? Put these unknowns together and there is a hypothesis that the original feature of Stonehenge was a line of three man-made mounds with upright stones. It is only a wild hypothesis, but it is one that can be tested. UPDATE - http://www.sarsen.org/2013/07/digging-into-david-fields-central-mound.html has the results of an excavation in the central mound area. It is the stranded lump in the pavement in front of the pub. This stone was found in 1899 in a gravel pit on the site of an ancient river bed and moved to its current site just inside the gate to Elthorne Park in Hanwell, west London. It is roughly 18" deep and 5' square but was formerly much larger as large chunks have been knocked off 3 of its sides. It was glacially deposited and belongs to the middle division of the London Lower Tertiary Sandstones. 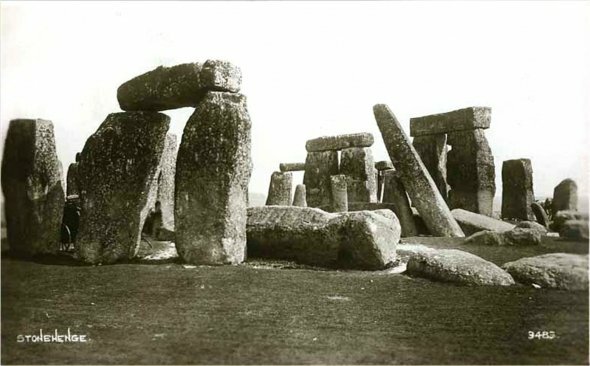 It is of similar age, origin and composition to the Sarsens of Stonehenge. 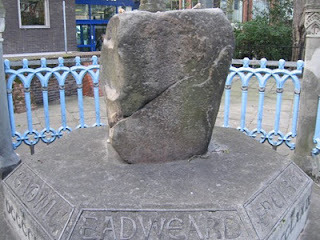 The Coronation Stone is an ancient sarsen stone block, located next to the Guildhall in Kingston upon Thames, England. Kingston is now a suburb of London and was once the county town of Surrey. In Old English, tun, ton or don meant farmstead or settlement, so the name Kingston appears to mean farmstead of the kings. Early sources claim that at least seven of the old Saxon kings of England were crowned at Kingston as they stood or sat on the stone. A local legend that these Saxon coronations gave Kingston its name is contradicted by the records of the 838 council. 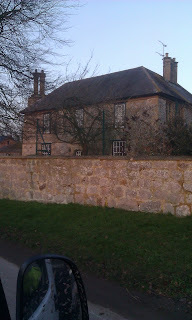 A house and wall made of sarsens in Stanton St Bernard, a village on the northern side of the Pewsey Vale. The whole village is full of Sarsens and Stanton means the "village" of Stones. About 500m west of Woodhenge is the Cuckoo Stone, a squat sarsen boulder which lies on its side. A large trench was excavated around it to reveal the hole, immediately to its west, in which the stone originally sat. The shape of the hole closely matches that of the stone when recumbent and, as with the nearby Bulford standing stone excavated in 2005, it seems most likely that the Cuckoo Stone lay in this position as a natural feature before it was set on end as a standing stone. 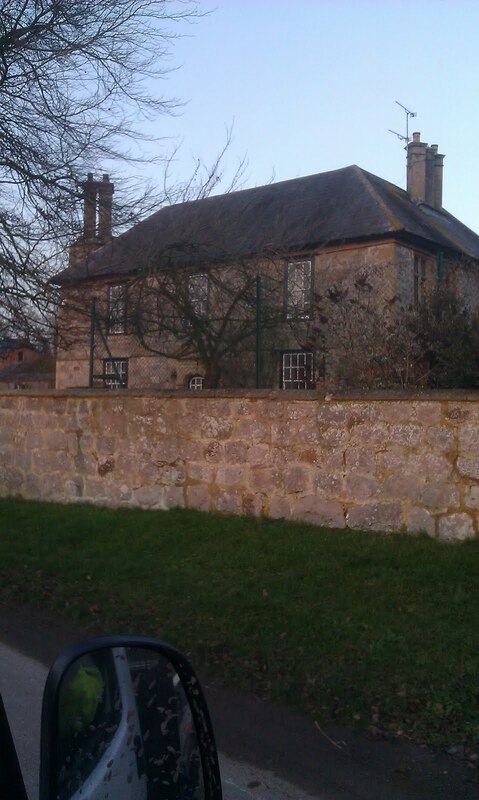 The Cuckoo Stone compares well with the Tor Stone at Bulford, about a mile east of the River Avon. In 2005 excavations demonstrated that this stone was similarly associated with an Early Bronze Age cremation burial – in this case a double Food Vessel burial. It too had been raised from its natural recumbent position which was visible as a solution hollow." 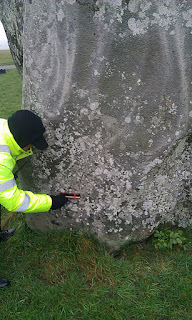 It is very possible that the Heel Stone and Station Stones are also local but their original lying places has not been found so the jury is still out. 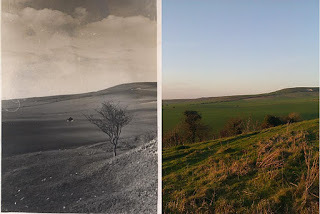 There is no evidence of any large number of Sarsen Stones anywhere on Salisbury Plain so I remain convinced the vast majority of the Sarsens came from the Marlborough Downs. The first draft available to download - any mistakes please tell me! Over five million years ago buried sand and gravel bars lying on top of the chalk of Southern England were cemented by silica. The composition and hardness of this layer varied. The subsequent millions of years of natural erosion wore most of this layer away leaving a few buried boulders and some extremely hard stones on the surface near where they formed. The builders of Stonehenge chose the hardest, finest and largest of these. The crispness of the edges of the stones stands testament to their hardness when they were shaped. It maybe that the Station Stones, for instance, are local, but there is no other credible source for most of the stones than from around Fyfield Down to the west of Marlborough, 18 miles to the north of the monument, where many stones still remain on the surface to this day. The accepted view is that the stones were taken on a westerly route around the Pewsey Vale. Recent field work and surveys of the landscape makes this seem unlikely as the route would have involved crossing two large marshes, a hill and then going up a steep incline. 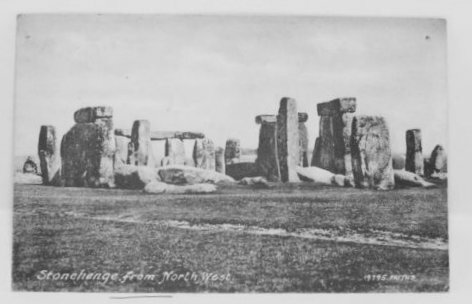 The climate at the time of the building of Stonehenge was similar to now so the marshes and swampy streams of the Pewsey Vale were an obstacle to crossing it for all of the year. But there was one firm, dry route possible. This is the route mapped overleaf which is the shortest and most direct. Ancient roads follow it with no excessive inclines and no marshes to cross. The River Avon would be crossed at its narrowest point which is at the contemporaneous and mysterious Marden Henge, which maybe one day will yield some more clues. We will never know the full story of the stones and assuming the easiest route is the route they took may be a mistake. After all if the builders had wanted the easy life they wouldn’t have built Stonehenge.